Every conference I have attended recently has had multiple sessions on feedback. Given that John Hattie states in Visible Learning that the average effect size of feedback is .73, it is no wonder that there has been a focus on the role of feedback in the classroom. Students aren’t the only ones to benefit from feedback. Feedback to teachers on instruction has a high effect size (.90) and is among Hattie’s top ten influences on achievement. 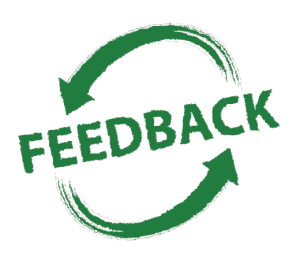 If formative feedback has such a profound impact on student learning and it is our expectation that teachers give high quality feedback to their students, it is imperative that administrators provide feedback on instruction as well. The best way to do this is through daily walk-throughs that focus on instruction and student engagement. I’ve spent the past two years working with building and district administrators on collecting data through classroom walk-throughs in order to improve instruction in our classrooms. At first this seemed like an easy task, something I believed that any instructional leader learned how to do in a Supervision of Instruction course. Boy was I wrong. Our district conducts collaborative observations throughout the year. Two administrators observe the same lesson and then are asked to provide written feedback to the teacher and debrief the lesson with a third party observer. As the third party observer, I was surprised at how two people, observing the same lesson, can come away with completely different take-aways. Were the three of us in the same classroom? We needed to do a little work on inter-rater reliability! Having conducted a couple hundred collaborative walk-throughs and read through a few thousand more, I have come to learn that one person’s idea of feedback varies greatly from another’s. One principal may write “Nice class!” as their comment and the other may have a minute by minute scripting of the lesson. Polar opposites and neither one true feedback. “Nice class!” is not feedback. It’s a pat on the head that has little to do with improving instruction (and, in fact, of little value to the teacher receiving it.) So if these “atta boys” aren’t feedback, what is? “Who would dispute the idea that feedback is a good thing? Both common sense and research make it clear: Formative assessment, consisting of lots of feedback and opportunities to use that feedback, enhances performance and achievement. Yet even John Hattie (2008), whose decades of research revealed that feedback was among the most powerful influences on achievement, acknowledges that he has “struggled to understand the concept” (p.173). In a nutshell, feedback is data about how we are doing in our attempts to reach a goal…in this case, student achievement though a teacher’s instruction in class. The purpose of formative feedback is to provide the teacher with data and insight on the effectiveness of the lesson (How are they doing? )…feedback is NOT praise, advice, judgmental or punitive. Feedback should be personalized, specific, timely, actionable and tangible and used to start conversations about improving instruction. 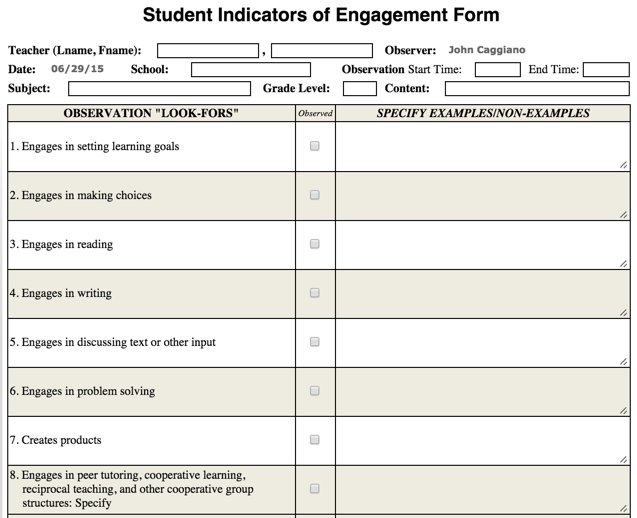 It was obvious from what I saw during collaborative observations and read on walkthrough forms that our district needed work on gaining a common understanding of what engagement looked like and how to provide formative feedback to improve instruction. I won’t go into detail about the ten months we spent working on improving the feedback we give teachers, and I’m not saying we don’t still have work to do, but I am seeing a lot less “atta boys!” than before and that’s a step in the right direction. "Great class! : Your activity cutting pizza pies into different numbers of slices gave the students a real-world application of fractions. "I didn't like the way students were working in groups. I would have assigned them each roles." "How could you have held all students accountable for the work they were doing in their groups?" "Many students were not paying attention." 3/22 students were at the board writing the answers to the math equations. How could you have re-structured the activity so that the other 19 students were actively engaged in the learning as well. So learn a lesson from our experience. Ask yourself a few questions about the feedback you’re giving. Does it lend itself to reflective practice? Will it help the teacher improve instruction? Would love to hear your thoughts on formative feedback! This entry was posted in Feedback and tagged feedback, John Hattie, observation. Bookmark the permalink.